This entry was posted in Uncategorized and tagged carlos celdran, Catholic Church, Family planning, philippines. Bookmark the permalink. HOW ABOUT DOING A CELDRAN MOVE TOMORROW. HE OPENED OUR EYES !!! is it right to express improper protest inside the church?? and take note….while celebrating a worship act?? ignorant people really don’t know what the Church teaches…….the Church which founded by Christ himself…..i will not wonder why there are so many immoral people out there because of their liberal view on life..they make ‘god’ out of themselves…I will pray for Celdran……. try to introspect first how you practice your moral life…. aren’t we being a bit hypocritical? Carlos was freed on Friday 1st October . It must have been after your post . yes. this was posted a few hours before he posted bail, if i recall correctly. I’m strongly agree about Carlos Celdran advocacy about the reproductive health (RH) bill because he personified Rizal’s principles in taking advantage of Rizal’s well-known battles against the Church, a battle that is already history, and even before Rizal was executed, was already history. I must take my own bowler hat off to Carlos Celdran, who’s bowled over everyone by dramatically putting a face and a word to a burning issue, thus effectively hastening the crumbling of an institution known to retreat from territory to territory as it desperately conducts rear-guard action in defending its often outmoded views and I believe in some views and principles towards the ill disposition of the Catholic church and I think creating a scandal in church was necessary to awaken the mind of the Filipino about the problem of our countries today eventhough he condemn disrespect against the catholic church. Raising the flock card DAMASO in the front of the friars, bishops and to the people of manila cathedral was a big bang that was made by Carlos Celdran, because Padre Damaso was a portrait and a perfect caricature of Roman Catholicism in the Philippines, he was a perfect villain. Cunning, self-righteous hypocrite Damaso was a man of faith who hides a dark, immoral secret. A meddler with little concern to those he hurts. Padre Damaso was an antagonist, just like today’s bishops those who use religion not only as a shield, but also as a weapon, protection, fortress and armor. Because of these recent events in the issue of artificial birth control and responsible parenthood, the word excommunication was again resurrected from its forgotten slumber. Excommunication was the Roman Catholic answer to those who defy their orders and well that was when most people still believe in curses and bad omen. Dr. Jose Rizal wrote the Noli Me tangere to distinguished the true religion from the false, the superstitious from that commercialism that uses the sacred word to extort money, to make us believe in foolish things, of which Catholicism would be ashamed if it had known from them. Even today, the Roman Catholic Church still insist that its stand against artificial birth control is a call against the moral implication of these methods. The church is adamant that it is only protecting the state against immorality. But is morality the only issue? How about doctrines, are that also a part of the responsibility? The main reason why the Catholic Church is against artificial birth control is found in their doctrines that promotes Natural Law. Artificial birth control methods alter God’s intention – the natural consequences when man and woman form a union. Today the issue of over-population is turning our survival at a balance and the time has come for Roman Catholics to recognize that traditional dogmas can’t save us. Responsibility doesn’t end on conception, it starts there. Responsibility also includes thinking for your child and your neighbor’s welfare. 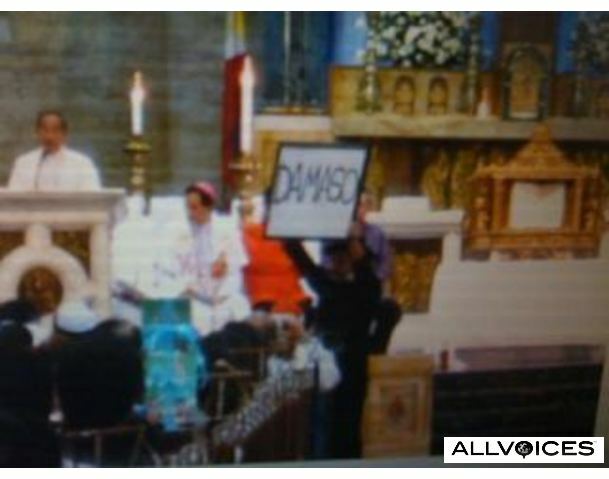 In my own perspective we must stop listening to Padre Damaso. All he did was to bring despair and hopelessness to Maria Clara and Ibarra. Personal theologies and doctrines are not solutions. What we must do is to throw Damaso and let the “Pilosopong Tasyo” re-kindle our rationality to save our own patrimony and that is the best solution that we can do to solve the problem our nation today.